How to Meet Your 2014 Financial Goals (Part 1) - Castle Rock Bankruptcy Attorney - Jon B. Clarke, P.C. January is usually a month during which people take stock of their achievements and make resolutions that can help them reach some goals they have in their sights. While oftentimes these goals can be related to people’s health and fitness, they may also include goals of improving their financial standing. If your goals for 2014 are financially motivated, here and in a forthcoming second part of this blog, we will give you some tips that can help you achieve these goals. First, create a financial plan – While it’s important to set goals for yourself, these goals will be meaningless if you don’t parse them out and fit them into a financial plan that gives you a roadmap for reaching these goals. One effective way of creating a realistic and useful financial plan is to think about your goals in terms of the specific steps you can take each month to slowly achieve them. For example, if your financial goal for 2014 is to pay off your credit card debt, then figure out how much debt you have and what you can afford to pay on your credit cards monthly; then, figure out which credit card you should focus on paying down (and ultimately paying off) first (generally, this should be the card associated with the highest interest rates). Regardless of what your specific financial goals are, having more discrete steps outlined for achieving these goals will give you better chances of succeeding as 2014 progresses. Next, focus on getting together a “rainy day” fund – If you already have a savings account, then continue investing in it; if you don’t, then make an effort to get this fund started, and continue contributing to it on a monthly basis. 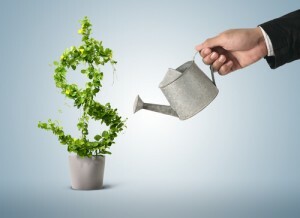 Whether you decide to have funds automatically transferred from your checking to your savings account or you just treat this investment as another monthly bill, accumulating a rainy day fund will be crucial to providing yourself with a financial safety net (and not derailing you from your primary financial goals for 2014) if an unforeseen expense – like a medical bill or a car repair bill – suddenly arises. Stay posted for our upcoming Part 2 of this blog for a few more strategies that can help you achieve your financial goals for 2014.